Self readers voted with their wallets on the notoriously Photoshopped Kelly Clarkson cover story: so far, it's the worst-selling issue of the year. Kelly's usually a crowd pleaser — so what changed? I have a theory. It's no surprise that Self put Clarkson on its key September issue – her August 2007 cover was a top seller that year, according to the Audit Bureau of Circulations. But according to WWD Memo Pad's Stephanie D. Smith (a former colleague), "The issue was the magazine's worst seller through September on newsstands, pulling in 220,000 copies and causing the magazine to miss its rate base that month." What went wrong? It's tempting to believe that widespread disdain at a grotesque Photoshop job was to blame, but that's not the whole story. 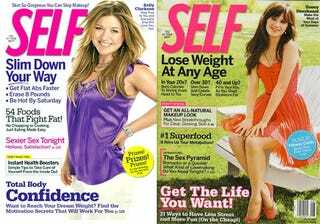 Once upon a time, women's magazines had a list of rules of what worked on covers –- which teases, colors, numbers postures, type of celebrity. The media world is a lot more crowded now, the rules are continually broken and disproved, and any ladymag editor will readily admit that predicting what will sell on a cover is by no means a science. Would you have guessed, for example, that Zooey Deschanel would be Self's best selling cover so far this year, outselling even number two contender Beyonce? (That's according to the Audit Bureau of Circulations' publisher reports). Something that fanned the popular outrage against the Self cover was the fact that anyone who cares could find out exactly what Clarkson really looks like online – and did. Everyone knows there's an element of fantasy in magazines, but when the reality (seen in hourly paparazzi and red carpet shots on blogs) and the polished image are so glaringly far apart, you can't blame readers for feeling like they're being taken for fools and walking on by. Yeah, Deschanel hasn't moved as many units as Clarkson or Beyonce. But take a look at that cover photo again. It's sunny and appealing – and it looks like her.